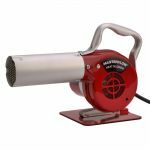 Master Appliance Masterflow Heavy-Duty, Industrial Quality, Continuous Duty Heat Blower. Can Be Purchased in three models. AH-301, AH-501, and AH-751. 3 models produce 300°F, 500°F or 750°F. High temperatures accommodate many heating, drying & shrinking applications.